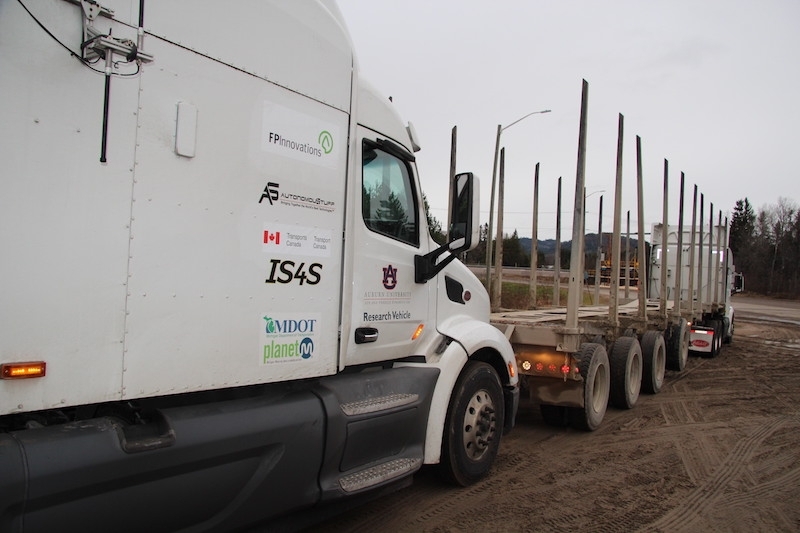 Nov. 7, 2018 – FPInnovations and its partners took truck platooning research a giant step further this week and earned a spot in history by successfully road testing the emerging technology in the deep forests of Quebec in the first trial of its kind in Canada. The trial took place in Rivière-aux-Rats, Quebec and signals the beginning of a transformation of the forest transportation industry on a scale not seen in decades. It could also solve the chronic issue of a skilled-driver shortage that’s plagued the industry for years and shows no signs of abating. The tests involved two platooned trucks hauling logging trailers on resource roads between a Resolute Forest Products saw mill and the company’s logging site 75 km away. Drivers were at the wheels of the trucks but in the future, only the lead truck will have a driver and the following trucks will be fully automated. The trial is part of a joint research project in collaboration with Transport Canada, Alabama’s Auburn University, and Resolute Forest Products. Earlier this week, platooning was also successfully tested by FPInnovations’ PIT Group, Transport Canada, and Auburn University on public highways in Quebec. The platooning technology was developed by Auburn University’s department of mechanical engineering. Truck platooning is an emerging vehicle technology in which trucks are linked by a computer system that maintains the desired distance between trucks, as well as controls acceleration and braking, reacting faster than a driver typically can. Platooning uses a dedicated short-range radio communications (DSRC) protocol approved for communications at high-speeds, as well as a GPS system and radar technology. Highway platooning is already legal in several U.S. states, including Tennessee and Georgia. However, platooning is only in the testing phase in Canada. FPInnovations will build upon the results of today’s tests to continue pioneering forestry truck platooning research in Canada. For more information, please contact Édouard Proust at edouard.proust@fpinnovations.ca.